Bicycle Touring Around the World: What's the Skinny? A couple weeks ago, after a little bit of bike drama, my hand-crafted wheel set arrived from Peter White Cycles. I'll let Tyler write about the Peter White drama if he wants to. I'm just excited to have two beautiful wheels! I drove to Minnesota to visit Tyler for a few days. During my stay, we got a lot of trip-stuff accomplished. * Monday we drove to All-Pro Powder Coating so that I could pick out a new color for my bike. 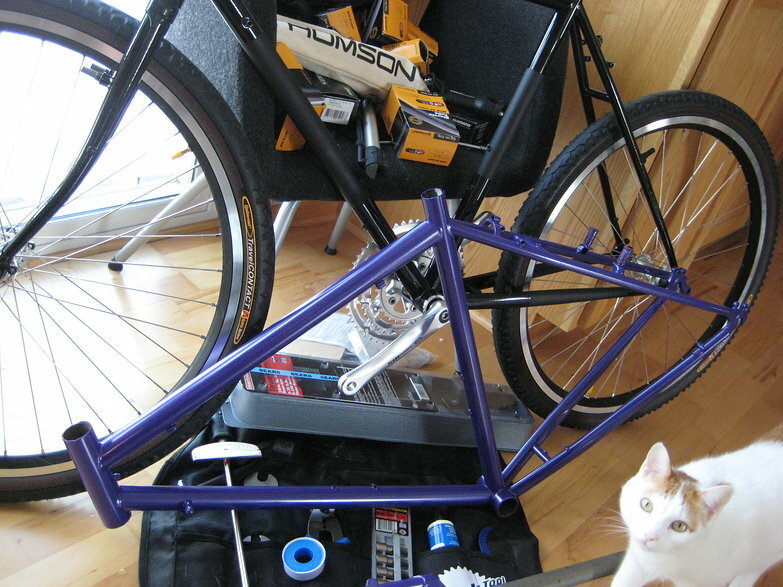 My bike frame was an intense purple color. I had never seen it in person, but as it turns out, Viking's purple isn't quite how I wanted my bike. I was tempted to let it go, because, well… "it's just a bike!" but Tyler encouraged me to get what I *REALLY* want, even if it costs a little more, because this bike is completely custom-built to suit me. This bike is my ULTIMATE bike. This bike is what I would be like if I were a bike. This bike should make me want to say "hell yes!" and not "meh." We arrived and there, on the wall, was the sample of the green color I was immediately drawn to in the first place. The color I wanted initially, but convinced myself otherwise, because it was more expensive. It's a beautiful color. Tyler's sleek road machine is lonely without its bright, sparkly companion :-( But she will join him once again in a week or two, sporting a funkier, more Tara-like coat. During our planning, we quickly realized that unless we want our trip to take years and years, it might be good to take a train for some stretches of the trip, possibly from Vietnam to Beijing, and possibly up the long, skinny stretch of Southern Thailand. We shall see. After we finish our plans, Tyler is going to send them to Jamie and Sarah, to see what they think and ask if they have any suggestions or advice. I am excited about this possibility, because while they don't know us from adam, I feel like they are our dear friends. Do check out their website! *Also during my stay, we began Operation: Tyler-Needs-to-Learn-to-Like-Fish-and-Seafood-if-he's-going-to-make-it-in-Southeast-Asia. While it didn't pan out this trip, Tyler's (our) friend, Eli, and I are going to start having fish-cooking nights. Hopefully we can seduce Tyler's taste buds with delicious fish recipes.